When it comes to customer service, social media is always right. Today, social media is changing the way consumers interact with companies to such an extent that industry experts predict social media will be the future of customer service. 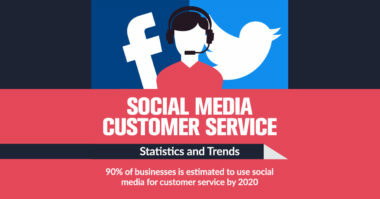 According to a new infographic by Go-Globe called “Social Media and Customer Service: Statistics and Trends,” a whopping 90% of businesses will use social media for customer service by 2020. And with more than a billion consumers on Facebook and hundreds of millions on Instagram and Twitter, social media provides a phenomenal forum for direct communication between consumers and brands. No wonder customer service interactions have soared 250% on Twitter over the last two years. Along with serving as an effective way for consumers and brands to communicate, social media is also surprisingly efficient. To understand the growing popularity of these platforms for customer care relations, Business 2 Community reported on why social responds so well to customer service. It’s no longer enough for a business to listen to a consumer complaint, customers now demand a response directly from the company. This used to cost businesses a lot of time, money, and resources because they had to build, staff, and operate customer call centers. Also, it cost customers time waiting to reach the proper departments and speak to the right representatives. But social media slashes those costs significantly by providing an inexpensive platform for direct access and communication. With the explosion of multiple messaging and smartphone apps in recent years, consumers now have countless ways to communicate with brands right at their fingertips. These technological tools make it much faster and easier for consumers to reach customer service representatives, which is making the platforms so popular among consumers. Responding to customer service matters on social media casts a favorable light on brands. According to the infographic, customers that have a satisfying social media experience are three times more likely to recommend the company to others. Companies that fail to respond to a customer issue are perceived as insensitive and arrogant. Simply responding to a customer service issue in a timely manner on social media can greatly improve a company’s image and convey the brand’s integrity. According to the infographic, using social media for customer service saves brands time and money, while making customers spend more time and money. Handling customer care on social media costs only a fraction of call center interactions which is why many companies already favor dealing with customer issues on social platforms instead of by traditional telephone methods. Social media also saves time for consumers by letting them leave a comment or message on a brand’s social media page instead of spending hours on the phone. Just as important as the savings, is the rise in consumer spending that results from a positive social media experience. The infographic showed that consumers spend up to 40% more with a business when they receive a prompt customer service response. Social media is clearly the future of customer service, so brands would be wise to connect with the customer-centric concept today. Follow what matters in social media marketing. Contact MDG Advertising today at 561-338-7797 or visit mdgadvertising.com.